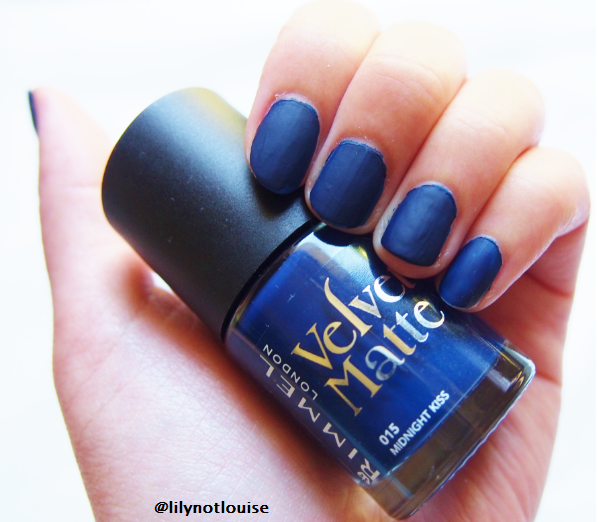 I've been living under a rock, I've never seen matte nail polish - until now. These products reminds me of the upcoming Cinderella movie, I can imagine Cinderella at the ball with matte products ... not sure why I think this, but it'll probably counteract her sparkly dress. With my old age, I always think that's it's never good to "double sparkle"... just like "double denim". This is my first matte nail polis and I absolutely loved the matte finish. The formula was fast drying and easy to apply with one single stroke. I don't usually wear blue, and I felt that the other colours would've suited me a little bit more, but I was wrong! I loved it! I would strongly recommend a top and base coat to go with this baby, unfortunately it started chipping on the second day, but you'll get some longevity with some quality top/ base coats. Unfortunately this wasn't the lippie for me, I was delighted with the shade at first, however it was way too light as my natural lip colour is significantly darker. I looked a bit sick when I had it on. The formula was a little bit dry for my lips and really highlighted the little flakes. My lips are unfortunately quite dry to begin with. The formula was indeed light weight and velvet smooth. The product was easy to apply and literally glided across my lips. I did get a few hours of wear from it - but not 8 hours, however I had to re-apply my lip balm to keep my lips hydrated on a regular basis. Are you a matte or glossy person? Pu'er is a funky fusion tea house hidden in Danks Street, Waterloo. We spotted the restaurant from a far, the neon orange panels of the outer shell was easily distinguished from the neighboring dull buildings. As we entered the restaurant, we felt like we've stepped into a vibrant, semi traditional Chinese Tea House that's been fitted with a restaurant and bar. I could drink these tea infused drinks everyday, they are sweet, but not syrupy and deliciously refreshing! Absolutely loved the combination of Jasmine tea, papaya and pineapples. Osmanthus phoenix cold infusion and fresh peach, now we all know peach flavoured ice teas are a common selection at almost any store as they are one of the more popular iced tea beverages, because they are so refreshing. Most store bought concoctions can often be obnoxiously sweet, this peach beverage is not overbearing and allows tea enthusiasts to try a more natural tasting peach ice tea - Which is something I have been desiring for sometime. With Osmanthus fast becoming one of my favorite teas, I loved the combination, absolutely perfect! This will be in my order again when I return. This drink was a perfect match for me, with my old age, I've parted with most alcoholic drinks, however, I will be forever receptive to yummy martinis! This would be my pick for a pre-meal's drink. My partner had the peach cocktail, and he adored it, the alcoholic content is a tiny bit higher than the martini. The prawns and scallops were juicy and succulent, the baby bamboo was tender and blended in well with the other ingredients. The roe on top provided an extra crunch. The yellow egg dumpling skin was rolled out nicely and a bit thicker than usual, but was able to hold it's content without breaking. The fluffy skin created an excellent equilibrium between the chewy contents and it's soft and vibrant outer shell. Well cooked, tender prawns (some of the best cooked prawns my partner has ever had) with a mysteriously delicious salsa, combined with freshness of half cut cherry tomatoes, a sprinkle of salt and candied tea. I can eat this everyday. A spectacular off the menu dish, definitely worth the wait for it to be on the menu. The Barramundi was cooked to perfection. The skin was crispy and the meat lightly cooked - just how I like it! The fermented black bean broth was rather strong and gave a light-tangy and tingling sensation on my tongue. The crunchy spring onions went really well with the fish and was a great tie-in with the black bean broth. These were served with Pu'er and spice infused tea eggs. Caramelised pork belly is a dish I grew up with, hence, I had to order this classic main. Under the crispy pork crackling were several generous pieces of pork belly. This dish was well composed with tender meat and some juicy layers of fat. The sauce was strong and ideally, the flavours would be complimented with a bowl of steamed rice to balance out the strong savoury flavours. The tea eggs were flavoursome, just like how mum makes it. This scrumptious chocolate brownie was rich, velvety smooth and gooey in the center, it was topped with salted almond praline that brought a sweet crispy crunch to the dark chocolate sensations and soft textures of the brownie. On the sides were sliced banana coated with a spiced wine jus, giving the banana a taste similar to cherries. To finish the dessert off, is a small bowl of salted palm sugar ice cream - the taste was comparative to salted butterscotch flavoured ice cream. The coconut and kaffir lime sorbet was relatively icy, however deliciously refreshing and tangy, perfect for summer evenings. I love that they serve this in an actual coconut shell that surrounds the sorbet with the meat of the young coconut. Overall, all elements of this dessert compliments each other, the black sticky rice was chewy, while the sorbet was refreshing, then you'd wash it all down with fresh coconut water. The really cool thing about the layout of these desserts is that it allows you to combine your desired amount of each element so the dessert is to your palette. This took us back to our trip to Shanghai earlier last year, it brought back sweet memories! With authentic Osmanthus sourced directly from China, we thought we would never have Osmanthus of the same capacity outside of China. We were wrong! Pu'er is a perfect homage of the funky little tea bars/houses that are extremely popular in Shanghai. Pu'er is a great place to relax and share a pot of tea, have a delicious meal or a few cocktails. It is a very tranquil environment with classic funk tunes playing at an enjoyable volume which makes it a great place for a catch up and chat with friends. The staff were very friendly and provided excellent customer service with a smile and few laughs during our visit. With good food and superstar customer service, it is definitely a restaurant that is worth returning. We would like to thank Quinton and Siev for the invitation to sample their unique menu and for their excellent hospitality.